April 2018: Here is a close-up of my face under a persistent “attack” from adult acne, redness and recurring allergic reactions. The main reason why the Goodness Face Elixir exists today is a selfish one. I made it for me, because no other product could clear or balance my skin. The journey to create it was quite inspirational as well. 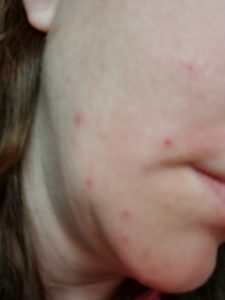 For years, I’ve been battling adult acne. Coupled with a thyroid condition, it seemed as if they skipped my teenage years and waited to surface in my 30s. Lower part of my face, along the jawline and neck persistently reflected that something was awry. My skin was also very sensitive, and perpetually undecided about its type – some days it was oily, others dry and itchy, and some days a combination of both. All of this made it challenging to find the right skincare routine. Over the years, I’ve tried everything the beauty industry cleverly advertised – from over-the-counter to prescription gels, creams, washes, scrubs, spot treatments, facial treatments, you name it. As nothing worked, I resorted to hiding my face behind primers, powders, concealers, and sometimes foundations. No matter how expensive or “high quality” these products claimed to be, they never looked natural on my face. I also disliked their cakey, heavy feel. Ingredient-wise, I kept wondering what my skin was actually absorbing, because I could not recognize or pronounce 90% of them. Despite all the clever advertising and promises, I felt these products were simply unhealthy for me. And I was right. My face reacted even more – with additional breakouts, redness, and allergies. That is when I decided to go back to nature and let her help me work through the problem, methodically and wisely, like nature only can. July 2018: Me after three weeks of using the Elixir once a day. Acne, redness and allergic reactions are gone. No makeup on my face and no photo edits. On a deeper level, our faces mirror our inner world. When we are stressed, tired, or unhappy, our faces show it before we ever say it. No matter how much we may attempt to hide or minimize it by putting our “brave faces” on, when our inner balance is compromised, the outer appearance reflects that. As such, my journey to clear skin was not just about fixing its surface. It was also about understanding what laid beneath and bringing that back to balance. And now: I keep using the Elixir and love it! My skin looks balanced, radiant, and truly rejuvenated. Personally, I had to take a step back and reflect on my life. I’ve been in the same career field for 22 years, and working in large corporations for the last 14 years. I’ve experienced different roles, advanced, and definitely learned a lot. However, I also found myself frequently wondering what else was out there. I read an article in which you were supposed to imagine asking your 90-year old self if she regretted not experiencing something specific when she was younger. If the answer was yes, then now would be the right time to go for it, thus ensuring your life is lived to the fullest and without regrets. My answer was yes, so I decided the time was right to allow myself to try something new, challenging, and personally meaningful. This led me back to my childhood love of botanicals. In the eight months that followed, I read and researched the forgotten books and materials on botanicals and herbal remedies. I travelled back to the Old World where people still believe in the healing power of nature. 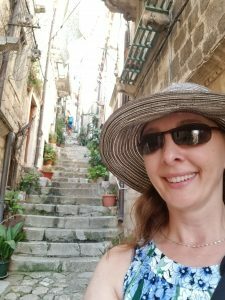 I visited old apothecaries, reconnected with far away family and friends, trusting that the journey would lead me to the answer. 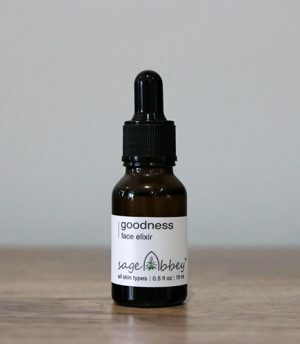 And it did – to Sage Abbey and my first product, the Goodness Face Elixir. The process of perfecting the Elixir took time, testing, and patience. In June of 2018, I started using the current formula once a day before bedtime. Those few drops on my face became an integral part of my daily de-stressing ritual. Together with a minimal, simple daily routine (cleansing my face with mild, unscented soap and water), my skin gradually cleared up, balanced, and rejuvenated, revealing its true self. And my inner journey was symbolically the same – transformational and revealing new possibilities. Every night, as the Elixir’s citrusy, earthy aroma affords me another moment of zen, I feel at peace knowing that life is a continuous process of change, learning, healing, and acceptance. And we need to take time and allow ourselves to enjoy all of its goodness.